Recalls and Complaints: App users can stay on top of safety issues for vehicles they already own. Consumers can register their vehicles to be notified by NHTSA if a safety issue is discovered. The app also makes it simple to submit complaints to NHTSA regarding possible safety problems with a particular vehicle. Help Installing Child Seats: The app helps consumers ensure their most precious passengers ride safe. Users can quickly get driving directions to the nearest child seat inspection station and get assistance to properly install their car seats and boosters. Safety Headlines and Alerts: App users can receive important news and information from NHTSA, as well as recall notices and push notices on their recorded vehicles. NHTSA adds that development is also underway for a version compatible with Android devices. 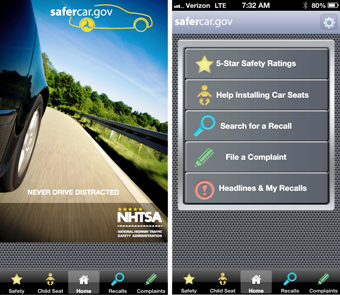 You can find more apps like SaferCar on the USA.gov Apps Gallery.